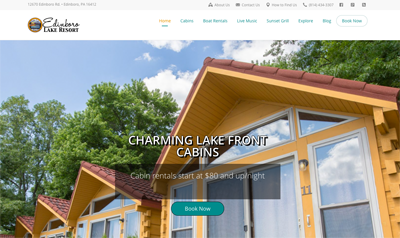 Love of travel and web savviness had us viewing resort and vacation rental website designs long before it was the standard that it is today. As timeshare owners, we search resort and vacation rental websites regularly for new travel experiences. We seldom stay at the same venue twice – not even our home resorts. Why bother when of timeshare exchange companies like RCI and Interval International and vacation clubs such as Global Connections, offer web portals and we can view thousands of resort and vacation rental website designs all in one spot. In addition to our timeshare travels and online vacation planning, we list our own vacation rental property. 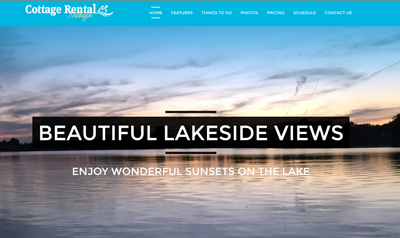 Our vacation property guests book online through our Michigan cottage rental website. We are not in a highly-sought Up-North Michigan location. We are not on any of the Michigan Great Lakes. Lake Michigan is at least an hour and a half away from our rental cottage. Our rental is just a kitschy one bedroom cottage on a small lake in mid-Michigan. Yet, each season we have to turn people away because we get booked up so early. With resort reviews, beautiful photos of every suite, villa, view, and amenity offered, finding a premium vacation rental is just a click away. Sadly, many very desirable resort destinations neglect to present their property and amenities effectively. When resort and vacation rental websites show views of a pristine beach or bright lights of the city with luxury designer furnishings, travelers feel confident booking their stay. When another beachfront resort has a website that doesn’t function on mobile devices, lacks standard features, or has outdated content and photos, visitors are not as confident and they search other options. Many vacation properties and resorts assume listing with RCI, II, Travelocity, TripAdvisor, Homeaway, AirBnB, etc. can serve as their online marketing. When travel or vacation rental referral sites suggest a property, visitors will still visit the actual resort and vacation property website. Even when photos and property descriptions are posted on the referral site, vacationers practice due diligence. Granted we stretch our points and seldom stay at 5 star resorts, but this kid has never stayed at a resort where there was a concern about cleanliness, let alone bugs. I share her response only to demonstrate how important visuals are in this world of internet shoppers. Even if resort furnishings aren’t top-of-the-line updating your resort and vacation property website designs can go a long way. Work with a company who gets you. It’s time to take charge of your online brand and improve your resort and vacation rental website designs. Give us a call today and let’s review your current website design and functionality. 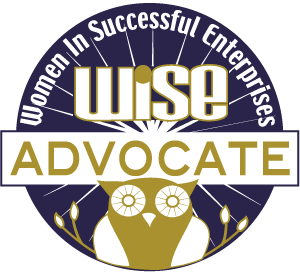 We can put together a cost effective, timely solution, within budget that exceeds your goals.